The Certified Fiber Optic Specialist Design (CFOS/D) training program is a two and a half day course. The course format is a mix of lecturing and hands-on practice through case studies. It will provide students with the opportunity to learn the techniques for capturing the design requirements and producing a successful fiber optic system design. 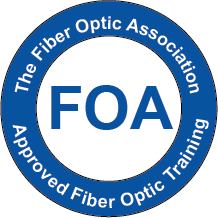 The FOA specialist certification CFOS/D, or Certified Fiber Optic Specialist in Design, is a course that covers how fiber optic networks are designed within the context of a complete communications system or a large infrastruction construction project. This training and vertification focuses on how to design a fiber optic cable plant that will satisfy all the transmission requirements of a desired communication system. It is intended for network users and operators, contractors, installers, architects, Engineers, project managers and everyone else involved in projects that include fiber optics. While fiber optic networks are the backbone of all telecom systems, they are widely used in other systems such as CATV, LANs, cellular phone towers, municipal wireless, security surveillance systems, metropolitan data networks, intelligent highway systems, fiber to the home. This is practically every communications network that you can think of. Since every fiber optic network is unique, its design needs to follow a thorough and detailed process from the beginning concept to the last commissioning step to ensure the design is successful. If you are not then you should have equivalent knowledge and experience in fiber optic communication technology and installation. How do you interview the client so you can gather all of their expectations? How do you bid on the work? How do you compose drawings? Where can you purchase all of the needed supplies? What are the predicted performance numbers? What is the process for testing the system? What is a passing grade during testing? What does a test report look like? What documentation do you deliver to the client?